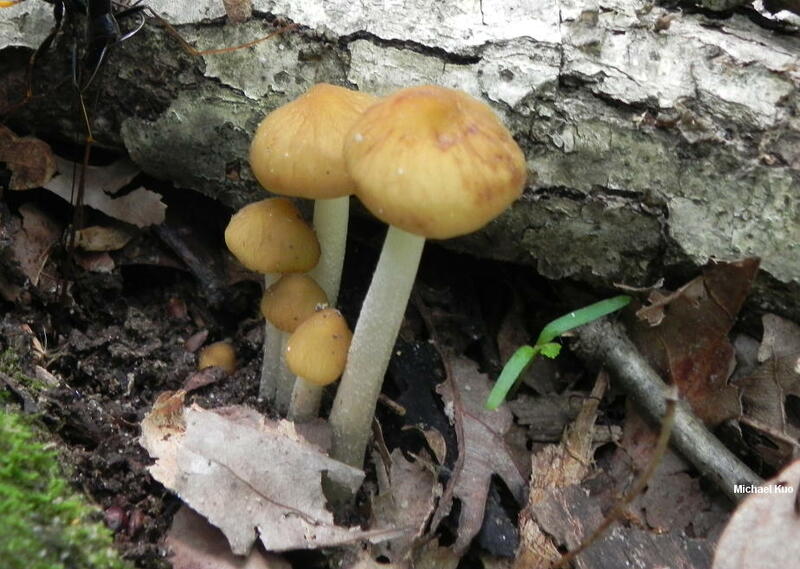 Originally collected by amateur mycologist Jay Justice in Arkansas, Hymenopellis sinapicolor is a small-spored, yellow-capped xeruloid mushroom recently designated (Petersen & Hughes, 2010) as a separate species supported by both mating and DNA analysis. I made the illustrated collection in Illinois, where the species was growing alongside whitish and brownish specimens of Hymenopellis incognita, around the same hickory stump. 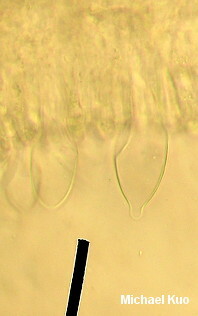 Since many of the xeruloid species are quite variable in color, I assumed all the specimens on the stump represented the same species--until, three and a half years later, I examined them under the microscope, where the yellow-capped specimens had significantly smaller spores and different cystidia. Older field guides probably combined Hymenopellis sinapicolor with what have since been designated as separate species of Hymenopellis, in treatments of "Collybia radicata," "Oudemansiella radicata," and "Xerula radicata." Ecology: Saprobic on the deadwood of hardwoods; attached to buried deadwood near stumps and logs, appearing terrestrial; late spring; distribution uncertain. Originally described from Arkansas; illustrated and described here from Illinois. Cap: 3-5 cm; bell-shaped when young, becoming broadly bell-shaped to broadly convex or nearly flat in age; bald; somewhat radially wrinkled; sticky to greasy when young, but soon dry; honey yellow to mustard yellow. Gills: Attached to the stem by means of a notch and a tiny tooth that runs down the stem; distant or nearly so; white; short-gills frequent. Stem: 5-9 cm long above ground; 0.5-1 cm thick; tapering to apex; bald or finely fibrillose; whitish; with a tapering tap root extending up to 4 cm underground. Flesh: White; thin; unchanging when sliced. Dried Specimens: Gills of dried specimens become pale pastel orange after several years in storage. 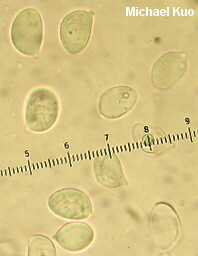 Microscopic Features: Spores 9-12 x 6-8 µ; ellipsoid at maturity; smooth; inamyloid; hyaline in KOH. Hymenial elements of herbarium specimens mostly hyaline in KOH. 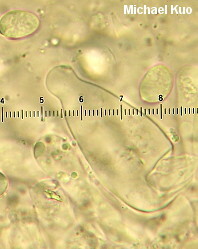 Pleurocystidia fusoid-ventricose to widely fusoid-ventricose; usually with a neck or mucro; occasionally subcapitate; thin-walled; hyaline; smooth; to 100 x 35 µ. Cheilocystidia similar to pleurocystidia. 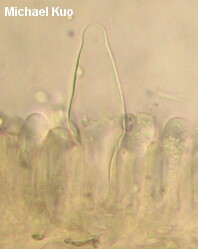 Pileipellis hymeniform and somewhat gelatinized; pileocystidia thin-walled, hyaline, up to 95 x 25 µ.
REFERENCES: R. H. Petersen & J. Justice, 2010. (Petersen & Hughes, 2010.) Herb. Kuo 05241104.